You are an explorer who has been traveling through space, looking for new planets for the Federation, and you have just discovered one not yet indexed! This is an opportunity to identify new creatures, discover rare resources, and fulfill intergalactic missions. This is the challenge you are facing: Earn the most victory points in order to make your exploration successful! 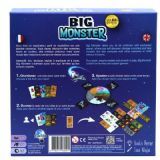 Big Monster is a "smart drafting" and tile-laying game that's played in two rounds. On a turn, each player (simultaneously) chooses a tile from their hand, places it face down in front of them, then immediately gives their remaining tiles to another player of their choice who hasn't already been given tiles. That is what's defined as "smart drafting". At the end of the game, each player owns 18 tiles in their exploration space. You earn victory points by finding monsters, completing crystals, and achieving missions. The player with most victory points at the end of the second round wins. 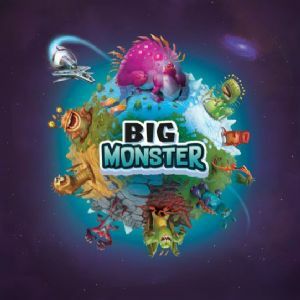 Big Monster can also be played in teams, and when doing so, the score of each team is the score of the team member with the fewest victory points. 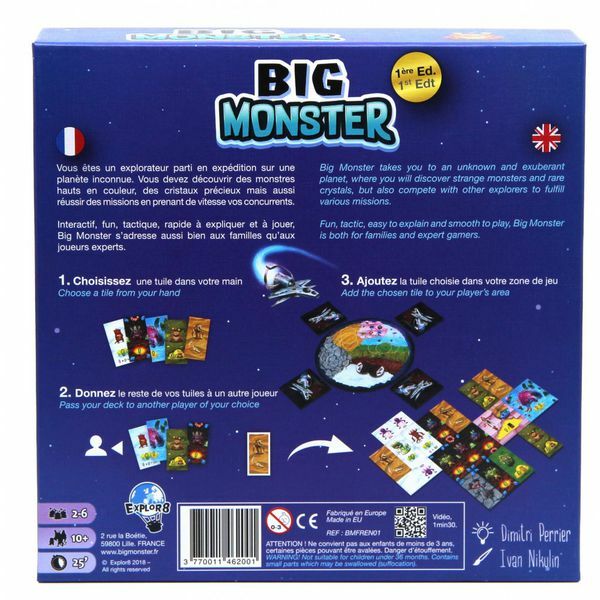 Big Monster is also a two players game, and when doing so, you do not use "smart draft". There is a special rule for 2 players.